Trellises, or supports for plants, are needed in the flower and vegetable garden not only for climbers, but for keeping plants which have weak stems within proper bounds. Trellises for pots may be purchased ready-made, as may those for climbing roses and such plants; they are usually made of rattan upon a frame of light wooden stakes, and some are made entirely of wire. A per-son of a mechanical turn can readily make all that will be needed. A few engravings are given here as suggestions. Fig. 133 shows a useful support made with a barrel hoop and staves; the same plan may be carried out with two or more hoops, and laths, if staves are too heavy. This will answer for tomatoes, raspberries, and various other plants. A more permanent tomato trellis is shown in Fig. 133, in which slats are supported by a shaped uprights. 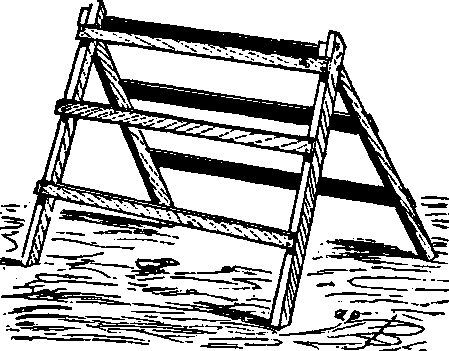 If put together with screws, such a trellis may be carefully put away in the fall and made to last several years. A rustic trellis, like that in Fig. 134, is often useful in the flower garden, or it may serve when covered with climbers to divide the flower from the vegetable garden. 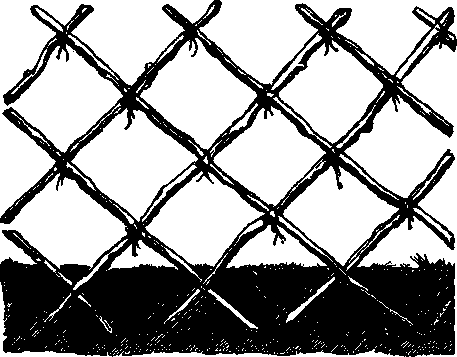 It is made of sticks of cedar or other durable wood, set as shown in the engraving, and tied where the bars cross one another with strong tarred twine. With these examples as suggestions, one will find no difficulty in making more elaborate supports and with other materials. Fig. 138. - Tomato Trellis. Fig. 184. - Rustic Trellis.